Technical Support for the Alameda Countywide Clean Water Program - Applied Marine Sciences, Inc.
AMS provides technical assistance to the Alameda Countywide Clean Water Program in support of the program’s National Pollutant Discharge Elimination System (NPDES) permit. Our scientists provide the program with monitoring, analysis, and reporting consistent with the municipal regional stormwater permit requirements. 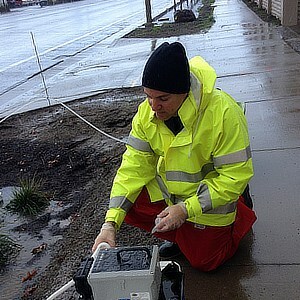 In addition, AMS reviews literature of various pollutants of concern to stormwater managers, performs source identification studies to locate hotspots contributing important loads of Polychlorinated Biphenyls (PCBs) and mercury to the San Francisco Estuary, and designs and implements multiple investigations to support Total Maximum Daily Load (TMDL) compliance efforts. © 2019 Applied Marine Sciences, Inc.